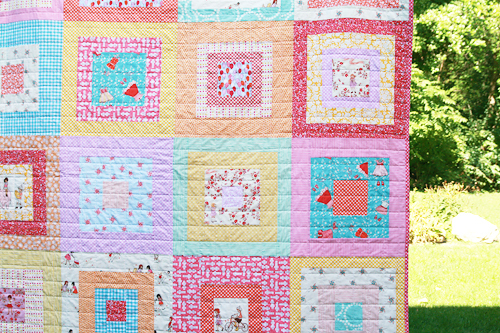 This is a quilt I've been wanting to make for a long time. 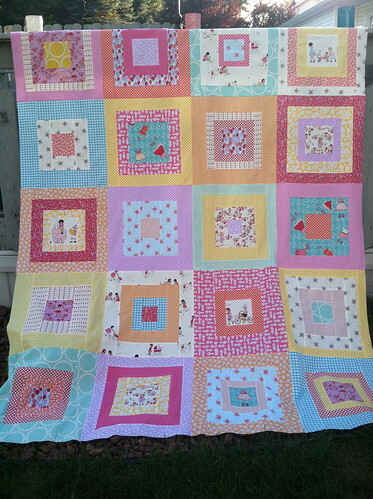 I wasn't sure what the design would end up being, what fabric I would use...but I knew I wanted to make a quilt for my little girl's bed. 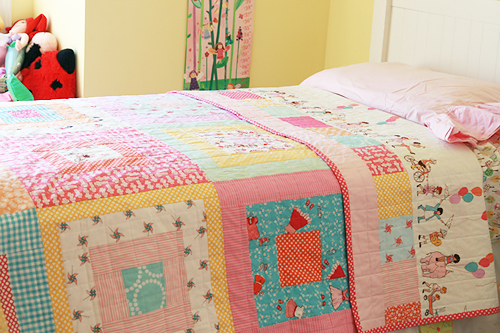 I feel a tad bit guilty that although I'm a quilter, the quilts on my kid's beds are store bought. Well now at least one is handmade by mommy. I started this quilt earlier this summer and planned to make a couple blocks a week. I sized each block at 17.5" x 17.5" unfinished so I would only need to make 20 for a twin sized quilt. My block progress stalled for awhile but when I went up to Holly's for the weekend in July I finished them up. 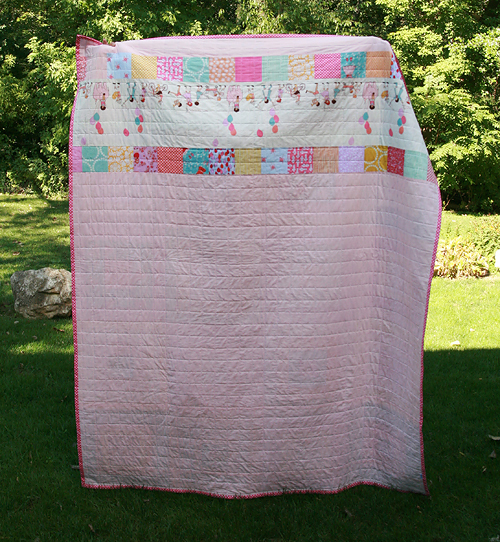 Of course it took me a bit longer to make the back, baste and quilt. But I'm really happy with the results! 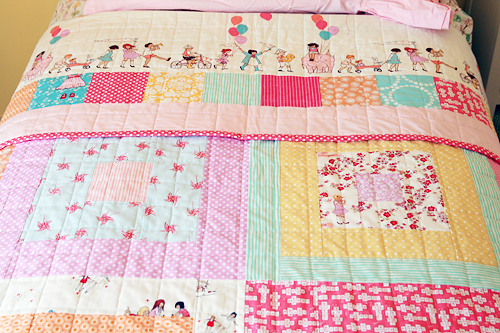 The quilt is centered around Sarah Jane Studios' Children at Play fabric line (one of my all time favorites). I incorporated a lot of blenders from my stash. There's really a little bit of everything in here - Patty Young's Lush Running Stitch, Lizzy House's Pearl Bracelets, Laurie Wisbrun's Modern Whimsy circles, some Art Gallery Oval Elements, dots from Heather Ross Lightening Bugs, some of the new stripes from Cloud 9's Simpatico, some of the yellow Henna Garden by Sandi Henderson, a yellow print from Maude Asbury's Kitchy Kitchen...plus some of the Children at Play blenders. I didn't follow a pattern for the blocks. I just started cutting the center squares and then pulled fabric and worked my way out from the center using different widths for each ring until I reached my goal size. I tried to follow a few rules for my blocks, such as each uses either 3 or 4 fabrics, no more, no less. One of my favorite parts of this quilt is the back. I decided to incorporate the Parade print from Children at Play. 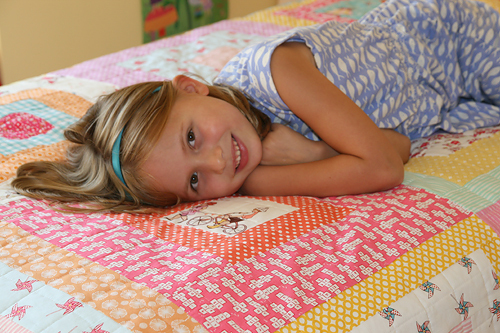 I wanted the print to show across the quilt when it was folded down on her bed. My poor husband, this quilt was SO big to hold up! That meant the print needed to be upside down on the back. I added a bit of patchwork above and below. 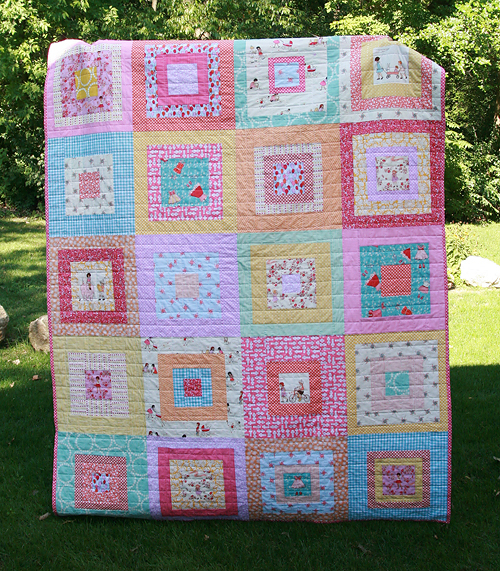 The solid pink is Michael Miller Cotton Couture in Blossom - SO wonderful. 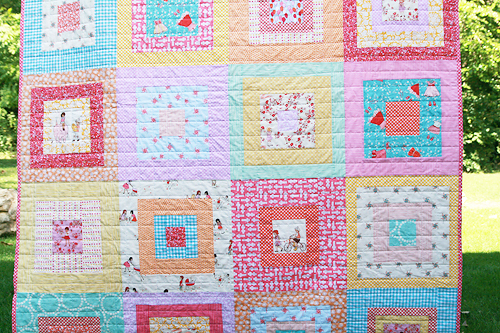 I wanted this quilt to be nice and soft so I quilted it in a grid with horizontal and vertical lines, about 2" apart. 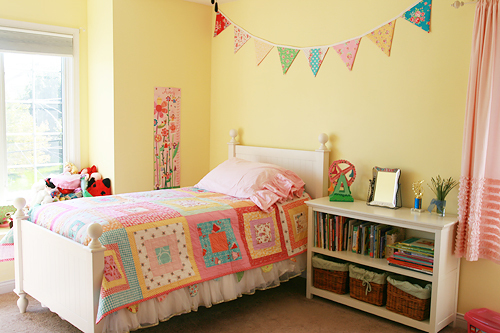 I love how the quilt compliments her room. She clearly loves it as well! I know there will be a time in the future (probably way too soon!) where she outgrows this quilt and doesn't want it on her bed anymore. But I'm hoping it will always hold a special place in her heart and she will maybe even let her own little girls cuddle under it one day.